It’s always amazing to watch female surfers taking their place in a male dominated line-up and really turning heads in the water, but it’s absolutely astonishing when that female is a 9-year-old girl! I first came across Sabre Norris in Newcastle, Australia where she could be seen surfing in the crowded line-ups around the city, and she ripped! Sabre charging hard at Flat Rock! During a trip north to Crescent Head we were rewarded with a decent swell and the crowds swarmed in to surf the point. There Sabre was again, taking on waves that towered over her, negotiating the hectic line-up with the skill of a surfer twice her age. To say I was in awe would be a massive understatement, it was obvious that this little lady was going places. 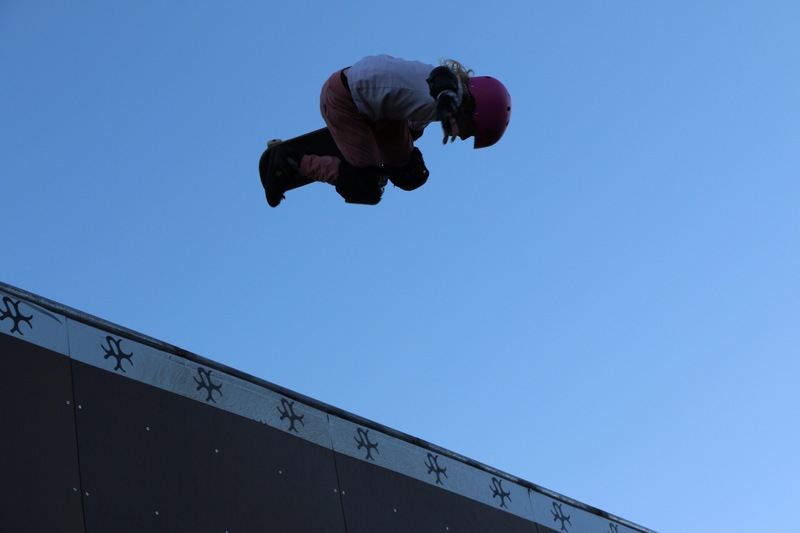 You can imagine my surprise when a few months later Sabre’s achievements were sprawled across the internet in the form of a skate clip; not only is she a talent in the water, but she goes hard on an Vert Ramp as well! Sabre is now only the third female in the world to have landed a 540! The clip went viral reaching over 1 million views and counting, and Sabre was rightly hailed a “Skateboarding Prodigy”. With such incredible skill and drive in and out of the water, Sabre is an inspiration to women everywhere … watch this space! 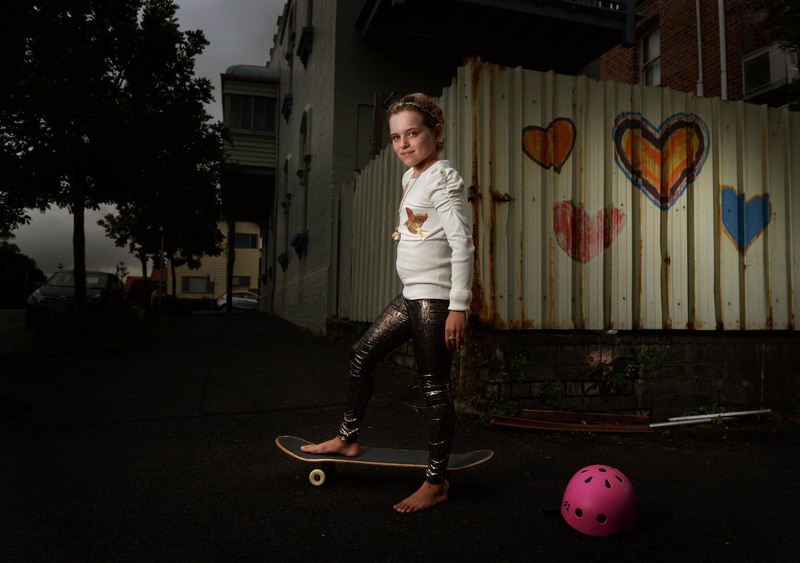 I caught up with the incredibly charming and outrageously talented Sabre, to get some insights into the world of a 9-year-old on the brink of a very bright future in boardsports. Do you have a favourite? Surfing or skating? I change my mind. Sometimes I think skating is my favourite then I change to surfing. I like skating because when you learn a trick for the first time it feels soooo good but when you fall off in surfing it doesn’t even hurt. That’s a really hard one to answer! Where is your favourite place to surf? If you could surf any wave, anywhere in the world, which wave or place would you choose? My dad said we would go to Bali when I’m 8 I’m now 9 and we still haven’t gone. I would love so much to go to Bali. I also want to go to Foster that is about 2 hours from my house but nobody has taken me yet. Do you have a hero, or favourite surfer? All my Merewether team mates are my heroes they look after me, I’m very lucky. There is a girl called Phillipa Anderson she is the best girl in the world at airs I think. She is pretty and kind and caring and rips. She always talks to me. A boy called Jacko Baker is super cool he always plays with my brother and he absolutely rips if you see his Instagram his airs are sooooo crazy. He inspires me to learn airs like him. What would be one thing about you that would surprise people? 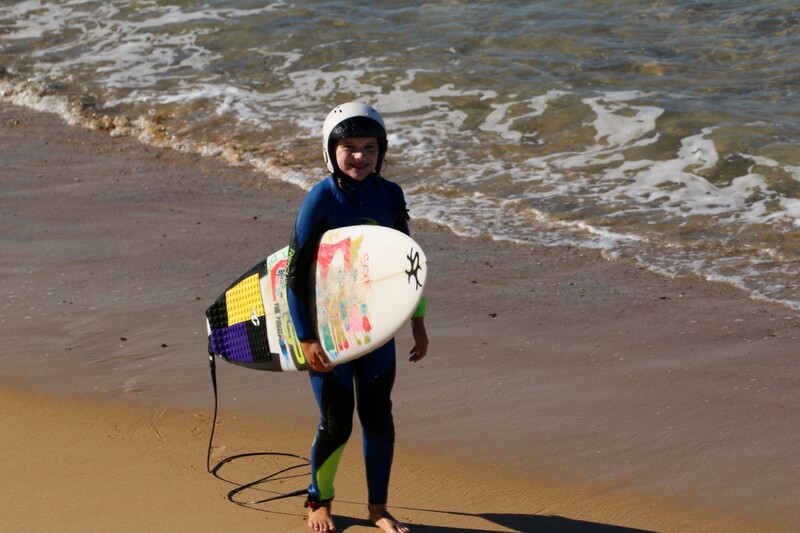 Besides the fact that you are 9-years-old and can surf and skate better than most adults! I can’t ride a bike! I’m not very good at catching a ball, I always shut my eyes and the ball hits me in the head. I want to have 6 kids but I don’t ever want to get married. How many brothers and sisters do you have and do they all surf too? Two sisters Naz and Sockie and a brother called Biggy. Surfing with my sisters and brother is the most fun, if they don’t come surfing with me it doesn’t feel as fun. I love when I catch a wave and they hoot and cheer and clap for me. We have fun little games in the water waiting for a wave to come. My little brother Biggy always grabs my leg rope and tries to get me to pull him out the back. My sisters and brother charge, they inspire me because when I see them going for something that makes me want to try too. What was your favourite part of the trip to Surfing Australia Hurley High Performance Centre? That’s easy, my favourite part was Clancy Dawson and Timmy. Clancy was my coach, I loved how he watched me surf he even filmed me. He taught me to just go for it, he taught me that it doesn’t mean you are a kook if you fall off. Timmy went on all the surfs with me. We frothed out together. He told me what waves to go and he helped block for me. I’m really worried that I will never see Clancy and Timmy again. What was it like competing for Merewether at the Australian Battle of the Boardriders with so many incredible Australian surfing legends? It was the absolute best thing in the whole wide world. I just wished I got to catch a proper wave. I didn’t surf very well it was really big and I couldn’t get out the back. I always wish I could have got a proper wave and smashed it to bits but it didn’t happen. How old were you when you competed in your first surfing competition? I’m not really allowed to do many comps. It’s very annoying. I did do a comp called Bus Blastoff when I was 9 I didn’t go very well though. Sabre going hard on the Vert Ramp. A massive congratulations on landing the 540! How did it feel to have so many people watching your video, and getting so much amazing feedback? It’s spins me out I didn’t think anyone would even care about it. It felt so good in my heart that people care and they say nice things to me. I think, boy am I lucky! What is the next skateboarding trick you are working on? I want to get a proper McTwist I’m so close but I just can’t seem to get it. I want to land one so much. I really really just want to make one so people will think it is proper and they won’t write that it wasn’t. What is the best skate competition you have competed in so far? That’s easy the Australian Bowl Riding Championship. That was the most fun ever. I was in the Merewether board riders. All my heroes were my team mates. They were all so nice to me I had the most fun ever. 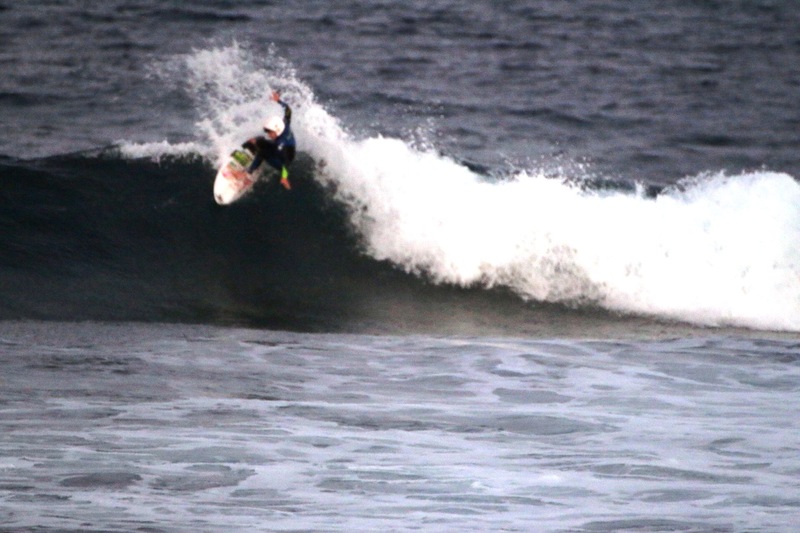 This entry was posted in Surf and tagged charging, female surfer, Prodigy, Sabre Norris, Skateboarding, surf, surf girl, waves by surfsaltylips. Bookmark the permalink.